It's been 13 years now, since I launched my very first Bob Dylan website. Since yesterday another new design is online and I hope you like it. Let me take you back to the previous stages of what is now known as Positively-BobDylan.com: It was in the mid-1990s at a time when there was no Google yet – can you imagine? – and the only link between yourself and the great mysterious web out there was the index of Yahoo! and AltaVista. The most popular browser was Netscape Navigator and web pages were all static. Many people didn’t know what web design was and there were hardly any books or online documentations available of how to use the Internet. It was the time after Bob Dylan’s acoustic album “World Gone Wrong”. Today you can easily create a new website or blog, everything’s pretty much automated and very well documented both online and offline. But more than a decade earlier it was a challenge really, you had to find out every little detail on your own. I wanted to create content that I would enjoy myself when surfing the web, so I ended up doing the very first generation of my site which was called “The 100% Pure Cult Website”, hosted on the free Geocities webspace which is now part of Yahoo!. It took me a few years to find out the potential of my project. At some point I realized that even without any Marketing involved, more and more people got interested in what I was doing. I didn't have web statistics in the beginning, so didn't know really what was going on, but the user feedback impressed me. 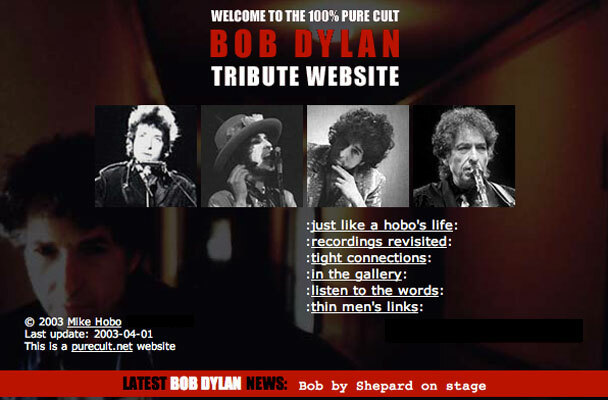 So I kept on developing new features and creating more genuine content for my site, and I decided to call it “Mike Hobo’s Legendary Bob Dylan Website”, which was actually supposed to be a joke but somehow came out to be more than that. At one point the site was so packed with features that it got harder for me to handle it all by myself. Web 2.0 was a major relief for me and I invited the visitors to post their own song comments, album ratings, and so on. And it went quite well. After three years I'm now running three Bob Dylan websites, positively-bobdylan.com, my main site, tweedlr.com dedicated to Bob Dylan song and album ratings and comments, and the Bob Dylan fans community milliondylanfans.com. People keep asking me why I’m putting so much time and effort into all these projects, and honestly I don’t really know. I just love it and I've somehow always felt that I had to do it. And so I keep on keepin' on, for myself and all the other Bob Dylan enthusiasts out there.